Snakes and Ladders Wooden Game is a beautifully simple rendition of this classic traditional game which originated in India and came to Victorian England in 1892. 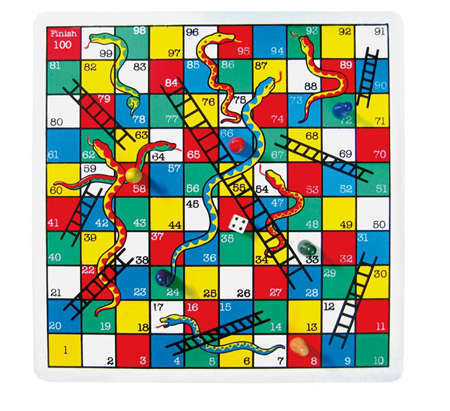 This set has a solid wooden board with the snakes and ladders design painted directly onto it. It comes with a dice and six coloured wooden playing pieces. This is a simple solid game and a great way to help with counting. Material: Wood, Plastic Dice, Wooden playing pieces. We like this because: "Lovely game nice simple design."